This is “Reducing Communication Apprehension”, section 3.3 from the book Public Speaking: Practice and Ethics (v. 1.0). For details on it (including licensing), click here. Explain steps for managing anxiety in the speech preparation process. Identify effective techniques for coping with anxiety during delivery. Recognize the general options available for stress reduction and anxiety management. Experiencing some nervousness about public speaking is normal. The energy created by this physiological response can be functional if you harness it as a resource for more effective public speaking. In this section, we suggest a number of steps that you can take to channel your stage fright into excitement and animation. We will begin with specific speech-related considerations and then briefly examine some of the more general anxiety management options available. release (the minute immediately following the end of the speech).Witt, P. L., Brown, K. C., Roberts, J. B., Weisel, J., Sawyer, C., & Behnke, R. (2006, March). Somatic anxiety patterns before, during and after giving a public speech. Southern Communication Journal, 71, 89. These researchers found that anxiety typically peaked at the anticipatory stage. In other words, we are likely to be most anxious right before we get up to speak. As we progress through our speech, our level of anxiety is likely to decline. Planning your speech to incorporate techniques for managing your nervousness at different times will help you decrease the overall level of stress you experience. We also offer a number of suggestions for managing your reactions while you are delivering your speech. As we mentioned earlier, communication apprehension begins in the mind as a psychological response. This underscores the importance of a speaker’s psychological attitude toward speaking. To prepare yourself mentally for a successful speaking experience, we recommend using a technique called cognitive restructuringA technique of deliberately replacing negative cognitions with positive ones.. Cognitive restructuring is simply changing how you label the physiological responses you will experience. Rather than thinking of public speaking as a dreaded obligation, make a conscious decision to consider it an exciting opportunity. The first audience member that you have to convince is yourself, by deliberately replacing negative thoughts with positive ones. If you say something to yourself often enough, you will gradually come to believe it. We also suggest practicing what communication scholars Metcalfe, Beebe, and Beebe call positive self-talkA habit of thinking in positive terms about your capabilities. rather than negative self-talkA habit of thinking in negative terms about your skills and abilities..Metcalfe, S. (1994). Building a speech. New York, NY: The Harcourt Press; Beebe, S.A., & Beebe, S. J. (2000). 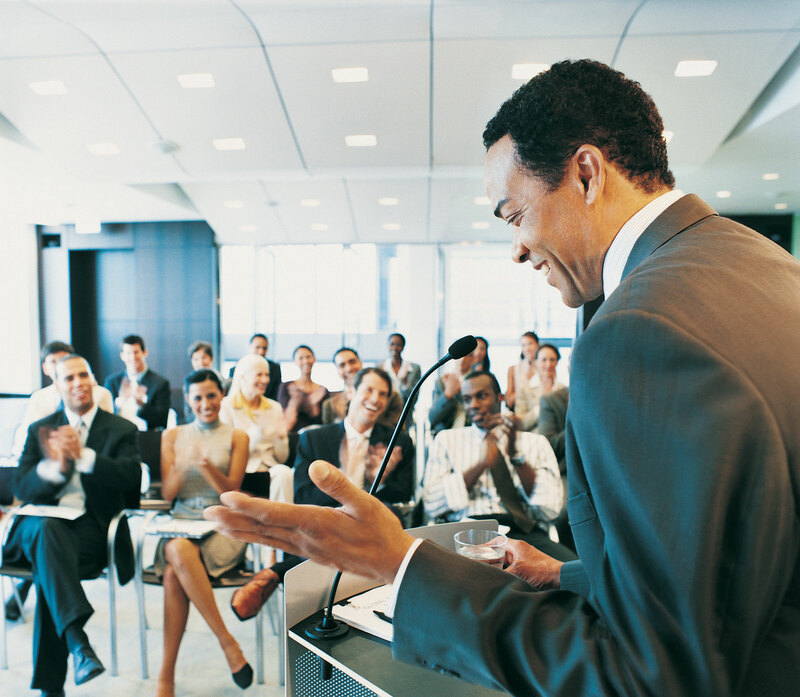 Public speaking: An audience centered approach. Boston, MA: Allyn & Bacon. If you find yourself thinking, “I’m going to forget everything when I get to the front of the room,” turn that negative message around to a positive one. Tell yourself, “I have notes to remind me what comes next, and the audience won’t know if I don’t cover everything in the order I planned.” The idea is to dispute your negative thoughts and replace them with positive ones, even if you think you are “conning” yourself. By monitoring how you talk about yourself, you can unlearn old patterns and change the ways you think about things that produce anxiety. As we have said earlier in this chapter, uncertainty makes for greater anxiety. Nothing is more frightening than facing the unknown. Although no one can see into the future and predict everything that will happen during a speech, every speaker can and should prepare so that the “unknowns” of the speech event are kept to a minimum. You can do this by gaining as much knowledge as possible about whom you will be addressing, what you will say, how you will say it, and where the speech will take place. The audience that we imagine in our minds is almost always more threatening than the reality of the people sitting in front of us. The more information you have about the characteristics of your audience, the more you will be able to craft an effective message. Since your stage fright is likely to be at its highest in the beginning of your speech, it is helpful to open the speech with a technique to prompt an audience response. You might try posing a question, asking for a show of hands, or sharing a story that you know is relevant to your listeners’ experience. When you see the audience responding to you by nodding, smiling, or answering questions, you will have directed the focus of attention from yourself to the audience. Such responses indicate success; they are positively reinforcing, and thus reduce your nervousness. Being prepared as a speaker means knowing the main points of your message so well that you can remember them even when you are feeling highly anxious, and the best way to learn those points is to create an outline for your speech. With a clear outline to follow, you will find it much easier to move from one point to the next without stumbling or getting lost. A note of caution is in order: you do not want to react to the stress of speaking by writing and memorizing a manuscript. Your audience will usually be able to tell that you wrote your speech out verbatim, and they will tune out very quickly. You are setting yourself up for disaster if you try to memorize a written text because the pressure of having to remember all those particulars will be tremendous. Moreover, if you have a momentary memory lapse during a memorized speech, you may have a lot of trouble continuing without starting over at the beginning. What you do want to prepare is a simple outline that reminds you of the progression of ideas in your speech. What is important is the order of your points, not the specifics of each sentence. It is perfectly fine if your speech varies in terms of specific language or examples each time you practice it. It may be a good idea to reinforce this organization through visual aids. When it comes to managing anxiety, visual aids have the added benefit of taking attention off the speaker. Another reason not to write out your speech as a manuscript is that to speak effectively you want your language to be adapted to the oral, not the written, mode. You will find your speaking anxiety more manageable if you speak in the oral mode because it will help you to feel like you are having a conversation with friends rather than delivering a formal proclamation. Appropriate oral style is more concrete and vivid than written style. Effective speaking relies on verbs rather than nouns, and the language is less complex. Long sentences may work well for novelists such as William Faulkner or James Joyce, where readers can go back and reread passages two, three, or even seven or eight times. Your listeners, though, cannot “rewind” you in order to catch ideas they miss the first time through. Don’t be afraid to use personal pronouns freely, frequently saying “I” and “me”—or better yet, “us” and “we.” Personal pronouns are much more effective in speaking than language constructions, such as the following “this author,” because they help you to build a connection with your audience. Another oral technique is to build audience questions into your speech. Rhetorical questions, questions that do not require a verbal answer, invite the audience to participate with your material by thinking about the implications of the question and how it might be answered. If you are graphic and concrete in your language selection, your audience is more likely to listen attentively. You will be able to see the audience listening, and this feedback will help to reduce your anxiety. It is not enough to practice your speech silently in your head. To reduce anxiety and increase the likelihood of a successful performance, you need to practice out loud in a situation similar to the one you will face when actually performing your speech. Practice delivering your speech out loud while standing on your feet. If you make a mistake, do not stop to correct it but continue all the way through your speech; that is what you will have to do when you are in front of the audience. If possible, practice in the actual room where you will be giving your speech. Not only will you have a better sense of what it will feel like to actually speak, but you may also have the chance to practice using presentation aids and potentially avoid distractions and glitches like incompatible computers, blown projector bulbs, or sunlight glaring in your eyes. Two very useful tools for anxiety-reducing practice are a clock and a mirror. Use the clock to time your speech, being aware that most novice speakers speak too fast, not too slowly. By ensuring that you are within the time guidelines, you will eliminate the embarrassment of having to cut your remarks short because you’ve run out of time or of not having enough to say to fulfill the assignment. Use the mirror to gauge how well you are maintaining eye contact with your audience; it will allow you to check that you are looking up from your notes. It will also help you build the habit of using appropriate facial expressions to convey the emotions in your speech. While you might feel a little absurd practicing your speech out loud in front of a mirror, the practice that you do before your speech can make you much less anxious when it comes time to face the audience. A final tip about preparation is to watch what you eat immediately before speaking. The butterflies in your stomach are likely to be more noticeable if you skip normal meals. While you should eat normally, you should avoid caffeinated drinks because they can make your shaking hands worse. Carbohydrates operate as natural sedatives, so you may want to eat carbohydrates to help slow down your metabolism and to avoid fried or very spicy foods that may upset your stomach. Especially if you are speaking in the morning, be sure to have breakfast. If you haven’t had anything to eat or drink since dinner the night before, dizziness and light-headedness are very real possibilities. There are a number of steps you can take to counteract the negative physiological effects of stress on the body. Deep breathingA relaxation technique that involves expanding the diaphragm to increase air flow. will help to counteract the effects of excess adrenaline. You can place symbols in your notes, like “slow down” or ☺, that remind you to pause and breathe during points in your speech. It is also a good idea to pause a moment before you get started to set an appropriate pace from the onset. Look at your audience and smile. It is a reflex for some of your audience members to smile back. Those smiles will reassure you that your audience members are friendly. Physical movement helps to channel some of the excess energy that your body produces in response to anxiety. If at all possible, move around the front of the room rather than remaining imprisoned behind the lectern or gripping it for dear life (avoid pacing nervously from side to side, however). Move closer to the audience and then stop for a moment. If you are afraid that moving away from the lectern will reveal your shaking hands, use note cards rather than a sheet of paper for your outline. Note cards do not quiver like paper, and they provide you with something to do with your hands. Vocal warm-ups are also important before speaking. Just as athletes warm up before practice or competition and musicians warm up before playing, speakers need to get their voices ready to speak. Talking with others before your speech or quietly humming to yourself can get your voice ready for your presentation. You can even sing or practice a bit of your speech out loud while you’re in the shower (just don’t wake the neighbors), where the warm, moist air is beneficial for your vocal mechanism. Gently yawning a few times is also an excellent way to stretch the key muscle groups involved in speaking. Immediately before you speak, you can relax the muscles of your neck and shoulders, rolling your head gently from side to side. Allow your arms to hang down your sides and stretch out your shoulders. Isometric exercisesA form of exercise in which you systematically tense and then relax certain muscle groups. that involve momentarily tensing and then relaxing specific muscle groups are an effective way to keep your muscles from becoming stiff. During your speech, make a point of establishing direct eye contact with your audience members. By looking at individuals, you establish a series of one-to-one contacts similar to interpersonal communication. An audience becomes much less threatening when you think of them not as an anonymous mass but as a collection of individuals. A colleague once shared his worst speaking experience when he reached the front of the room and forgot everything he was supposed to say. When I asked what he saw when he was in the front of the room, he looked at me like I was crazy. He responded, “I didn’t see anything. All I remember is a mental image of me up there in the front of the room blowing it.” Speaking anxiety becomes more intense if you focus on yourself rather than concentrating on your audience and your material. No matter how well we plan, unexpected things happen. That fact is what makes the public speaking situation so interesting. When the unexpected happens to you, do not let it rattle you. At the end of a class period late in the afternoon of a long day, a student raised her hand and asked me if I knew that I was wearing two different colored shoes, one black and one blue. I looked down and saw that she was right; my shoes did not match. I laughed at myself, complimented the student on her observational abilities and moved on with the important thing, the material I had to deliver. Even when we employ positive thinking and are well prepared, some of us still feel a great deal of anxiety about public speaking. When that is the case, it can be more helpful to use stress management than to try to make the anxiety go away. One general technique for managing stress is positive visualizationUsing the imagination to control stress and create images of success.. Visualization is the process of seeing something in your mind’s eye; essentially it is a form of self-hypnosis. Frequently used in sports training, positive visualization involves using the imagination to create images of relaxation or ultimate success. Essentially, you imagine in great detail the goal for which you are striving, say, a rousing round of applause after you give your speech. You mentally picture yourself standing at the front of the room, delivering your introduction, moving through the body of your speech, highlighting your presentation aids, and sharing a memorable conclusion. If you imagine a positive outcome, your body will respond to it as through it were real. Such mind-body techniques create the psychological grounds for us to achieve the goals we have imagined. As we discussed earlier, communication apprehension has a psychological basis, so mind-body techniques such as visualization can be important to reducing anxiety. It’s important to keep in mind, though, that visualization does not mean you can skip practicing your speech out loud. Just as an athlete still needs to work out and practice the sport, you need to practice your speech in order to achieve the positive results you visualize. Systematic desensitizationA behavioral modification technique that reduces anxiety by gradually exposing the individual to the object or situation they fear while teaching them basic relaxation techniques. is a behavioral modification technique that helps individuals overcome anxiety disorders. People with phobias, or irrational fears, tend to avoid the object of their fear. For example, people with a phobia of elevators avoid riding in elevators—and this only adds to their fear because they never “learn” that riding in elevators is usually perfectly safe. Systematic desensitization changes this avoidance pattern by gradually exposing the individual to the object of fear until it can be tolerated. First, the individual is trained in specific muscle relaxation techniques. Next, the individual learns to respond with conscious relaxation even when confronted with the situation that previously caused them fear. James McCroskey used this technique to treat students who suffered from severe, trait-based communication apprehension.McCroskey, J. C. (1972). The implementation of a large-scale program of systematic desensitization for communication apprehension. The Speech Teacher, 21, 255–264. He found that “the technique was eighty to ninety percent effective” for the people who received the training.McCroskey, J. C. (2001). An introduction to rhetorical communication. Boston, MA: Allyn & Bacon, p. 57. If you’re highly anxious about public speaking, you might begin a program of systematic desensitization by watching someone else give a speech. Once you are able to do this without discomfort, you would then move to talking about giving a speech yourself, practicing, and, eventually, delivering your speech. The success of techniques such as these clearly indicates that increased exposure to public speaking reduces overall anxiety. Consequently, you should seek out opportunities to speak in public rather than avoid them. As the famous political orator William Jennings Bryan once noted, “The ability to speak effectively is an acquirement rather than a gift.”Carnegie, D. (1955). Public speaking and influencing men in business. New York, NY: American Book Stratford Press, Inc. There are many steps you can take during the speech preparation process to manage your communication apprehension, including thinking positively, analyzing your audience, clearly organizing your ideas, adapting your language to the oral mode, and practicing. You can employ a variety of techniques while you are speaking to reduce your apprehension, such as anticipating your body’s reactions, focusing on the audience, and maintaining your sense of humor. Stress management techniques, including cognitive restructuring and systematic desensitization, can also be helpful. Go to http://www.hypknowsis.com and practice a few of the simple beginning visualization exercises presented there. Make a plan for managing your anxiety before and during your speech that includes specific techniques you want to try before your next public speaking assignment.